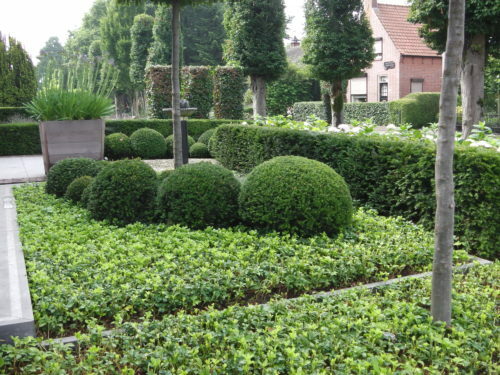 Yew Topiary Balls - Taxus Baccata Ball Shapes - Hopes Grove Nurseries. Top quality ball shaped specimens of Taxus baccata, the English Yew, these can be used to great effect in formal gardens where their deep green year round foliage is valued. English Yew or Taxus Baccata has long been used in the practice of topiary or clipping of shrubs to a specific architectural shape. The close-knit foliage when trimmed by the expert hand can give the finishing element of luxury to a straightforward hedge or garden design. Dating back to Roman times and perhaps earlier the word topiary is derived from the Greek topiarius or creator of topia or places, the art went out of fashion only to be revived in the 17th and 18th centuries for some of the dramatic designs to be found in the gardens of country houses and estates. Requiring a steady hand and a sharp pair of shears the English Yew Topiary Ball shapes also need a good eye for symmetry as they require trimming each year to sharpen the edges of the plant from the fronds of new growth, and of course where several Ball Shapes are included in the planting extra care needs to be taken to keep them all at the same diameter, although a modern cloud effect can be achieved by planting different diameter English Yew Topiary Ball Shapes together. In modern times of course for those who wish to take the easy option, rather like a pre-tied bow tie, it is possible to buy a frame through which to grow the English Yew and trim to the frame thus getting the shape and diameter correct. English Yew Topiary Ball Shapes do have the advantage that as a slow growing plant at between 15-30cm per year trimming is not so much of a problem as perhaps with other plants and is the most elegant for shaping as it can give such a smooth appearance to the finished Ball Shape. Trimming would normally be done in autumn. Grown in containers or planted directly into the garden English Yew requires reasonable soil with good drainage as it is not happy sitting in wet soil for any length of time. Container grown English Yew Topiary Ball Shapes are supplied throughout the year giving the option of planting when required and of course they can initially be placed in the pot in situ to make sure the garden design works, if not then it is easy to move them around before planting. 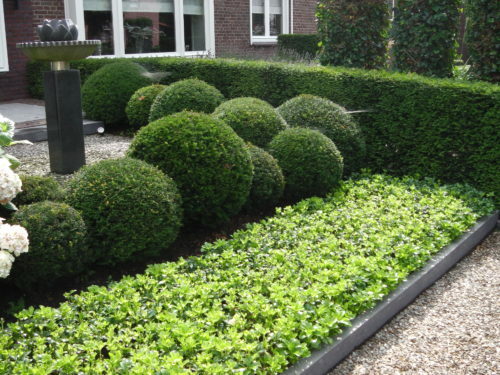 If you have any questions with reference to English Yew Topiary Ball Shapes with regard to planting or shaping or anything else ring one of our team in the office and we will endeavour to help.